Blog Burger Wars Jumps The Shark? Burger Wars Jumps The Shark? The people at the so-called NEWS have come up with their own A-list awards and have a burger category. How spectacular! But can you seriously trust any voting competition on fine dining when the other categories include best pilates, best dog kennels, and best pawn shop? 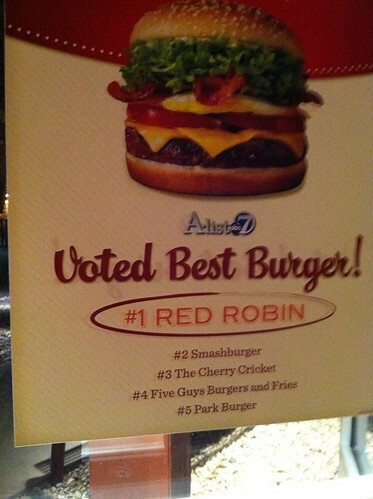 Red Robin on top. Hmmm. Yes, its pretty standard. It looks and tastes the same every time. They have a ton of choices. Always liked the fries and shakes there too. Not surprised. Smashburger coming in 2nd. They have expanded well in this area. Always busy too. Still think their shakes are crap but I assume the burger competition is pure and not counting that. Frankly, I really like their chicken these days. Leaves me feeling a bit fresher. The Cherry Cricket? Surprised it was on there because its not a chain. Brownie loves the place. I haven’t ever been inside sadly. But I take his word for it. The man introduced me to King Chef. He knows things. Five Guys in 4th. Over the years, I have grown to not hate this place anymore. I just didn’t understand it at first. I continually want everything to be In-N-Out and when its not, I curse it and blame it for being born. But now its been good to me. They just don’t have any options for my wife so I don’t get there as much. Finally, Park Burger. Never been either. I recall Mock giving it a nod. One of these days. Just haven’t been downtown at eat’n times lately. What did they miss? Larkburger feels like the big one to me.